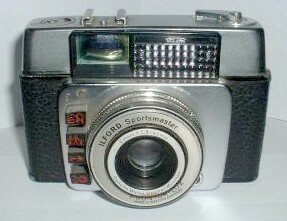 To view a picture taken in 2006 with this Sportsmaster, click here. The Sportsmaster went through at least two stages of development & refinement after its Spring 1961 introduction. 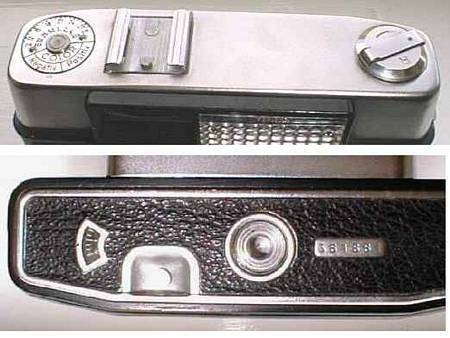 The above example is a mid-development model which incorporates the later f2.8 Cassar lens, a fold-over rewind crank in place of the knurled knob and the exposure counter is now self-resetting, on the underside of the camera, at the left hand end of the base plate, enabling the film reminder dial to become a flush fit on the left hand end of the top plate. From the above sample, it also seems that Ilford adopted a metres distance scale for the four shutter buttons, rather than retaining an imperial scale in feet, as on the earlier model (but see my comments lower down). 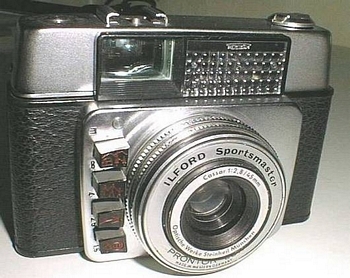 The rear lens of the viewfinder was increased in size, presumably to make it easier to see the 'auto' aperture indicator in the top of the viewfinder. Shown alongside is a comparison of the rear viewfinder lens on the updated Sportsmaster (with crank film rewind) versus the original Sportsmaster (with knob film rewind). The top and bottom of the updated Sportsmaster. Alongside is an illustration of yet another stage of development when the Sportsmaster was equipped with the extended rewind crank. This version has its four shutter button distances marked in feet, though similar exist with the distances marked in metres. Whether distance markings were consistently in feet on UK versions or whether it was a case of 'pot luck', with boths markings finding their way through the Dacora / Ilford quality control, is unknown. 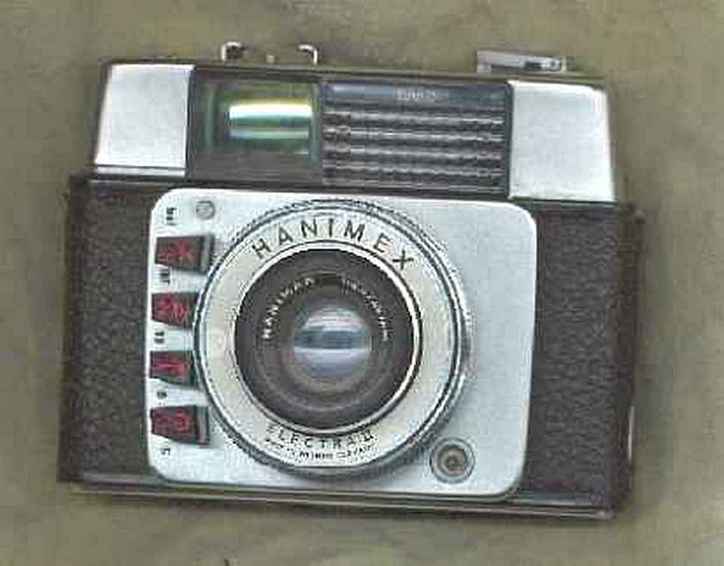 The latter version of the Sportsmaster but this time the Hanimex Electra II version with its Hanimar f2.8 45mm lens. 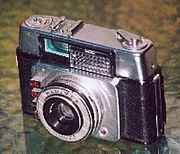 This camera is owned by Dave Durnford in New Zealand who has kindly sent me a picture and given his agreement for me to use it on my web site. Note the extended rewind crank, exactly as the third styling change of the Sportsmaster.